The Ordinary Life of an Extraordinary Girl: Book reviews! I love blogging, I love reading other people's blogs and I love meeting new friends, their families and learning their stories. And it is all because of a simple chromosome - who would have known how many ways this simple chromosome was going to enrich our lives. I have been fortunate to share our story, to journal about my teenager daughter with down syndrome and her life as she goes through high school, graduation (with an academic diploma) and college searching. Alex's goal is to live a future just like her siblings and just like her peers.She is truly living the ordinary life of an extraordinary girl. I have also been fortunate to have been able to put part of our story in writing hoping to share our challenges, triumphs and magic. This book was a labor of love, and the feedback I have received has reinforced our message of hope and love. This most recent review by Amber, really touched me because she shares her story too. We are all parents and families who have been graced with down syndrome. We are all trying to find our own way and be the best parents we can. 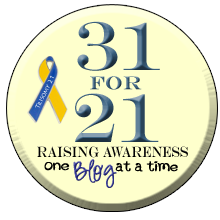 After blog-following some other moms with children who also have Down syndrome I came across the blog of a mom who's in an entirely different stage of life than me. She was blogging about hunting for colleges, and her daughters independence. She was blogging about her daughters accomplishment, and about everything I dream about for my little Royce. Her blog was more refreshing for me than any others. It was of hope, accomplishment, success, guidance, and joy. She has also published this book. It's an easy 74 page read that allows the reader to experience through her eyes. I found it honest and uncensored, helpful, personally un-relatable at times, yet completely relatable at others. The book is broken into 11 "verbs". First, Grief. Second, Research. And then: Incorporate, Promote, Include, Understand, Advocate, Expect the Best, Healthy Skepticism, Plan, and then Celebrate. 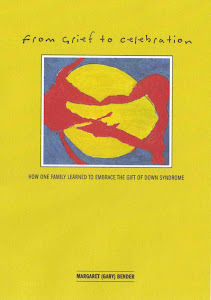 As a reminder - special pricing is available - http://downsyndrometeenager.blogspot.com/p/books-and-projects.html and will include Alex's signature!